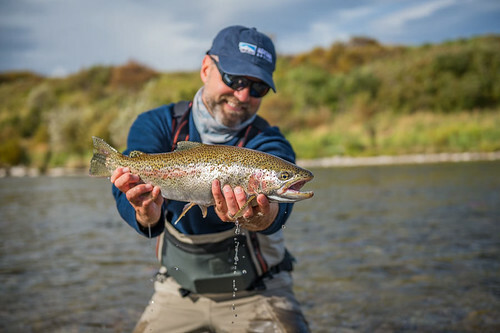 As a fishing guide in Yellowstone National Park, I am often asked questions like, “Where can I fish close to West Yellowstone in August?” or “What rivers near Gardiner fish well in early June?”. I pick these examples because, frankly, you would be very disappointed with the answer to each one. 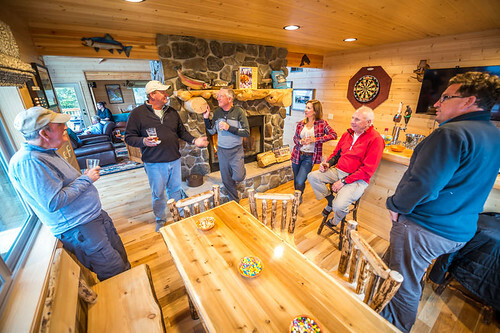 While Yellowstone Park is justly famous for its trout fishing, it is a very seasonal affair. You can find good fishing in the park every day of the fishing season, but no single river drainage fishes well for the duration of the season. Given that Yellowstone encompasses 2.2 million acres and sees over 3 million visitors per year, you can find yourself facing significant travel time to productive fishing if you do not plan your stay accordingly. The two factors that drive fishing in Yellowstone are snowmelt, which is true all over the West, and the effect of thermal heating and thermal runoff, a situation unique to the park. Streams that are heavily influenced by snowmelt will not be low and clear enough to fish until sometime in July. On the other hand, streams that drain thermal areas will be too warm for fishing during mid-summer. 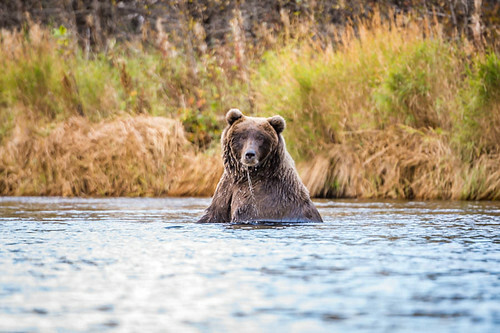 Understanding this dynamic will help you to make sure that you are in the right place at the right time during your Yellowstone fishing trip. 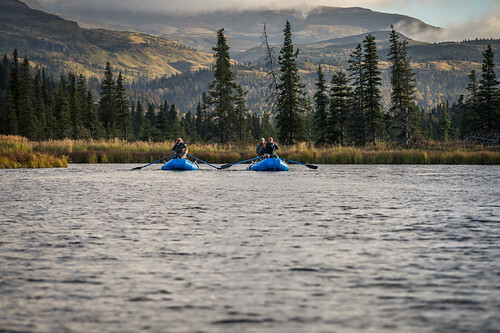 Without a doubt, the Madison drainage is the place to be during Yellowstone’s early season. When the season opens over Memorial Day weekend, the Firehole River will be fishing well, and it is often the only river in the park that is fishable. Both the Gibbon and the Madison River will begin to fish well within about a week of the opener. Good mayfly hatches are a common occurrence in June, allowing anglers to toss dry flies while many rivers around the West are choked with runoff. 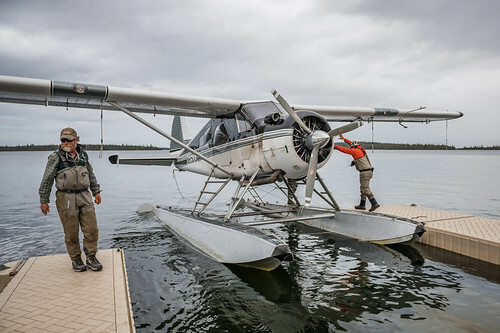 Around the middle of June, several lakes in the Gibbon drainage like Grebe Lake and Cascade Lake will become accessible and the bite will be hot. The Firehole also offers several tributaries that hold fish, such as Nez Perce Creek, that can provide some variety to a trip. 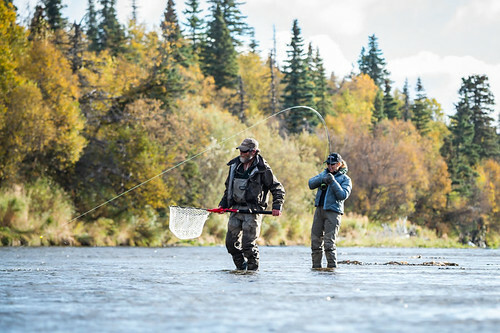 The town of West Yellowstone, MT is the hub of early season fishing activity. From West Yellowstone, you can be on the Madison within 10 minutes and the Gibbon and Firehole within 20. 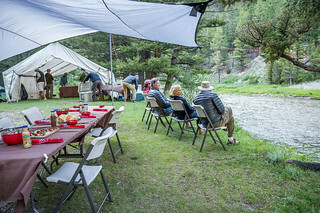 If you wish to stay inside of the park, camping at Madison Junction puts you right in the middle of the action. Old Faithful is a good choice as well, as the Firehole River is just minutes away. The last week in June marks the transition from spring to summer fishing in the park. The waters of the Madison drainage are becoming too warm for good fishing, especially in the afternoons. This can be a tricky time, as the Lamar drainage is not quite ready yet. Fortunately, the Gardner River provides a good option during this time frame. The river will just be dropping into shape and the Salmonflies and Golden Stones will be starting to hatch. Trout Lake, which opens to fishing on June 15th, is a good option during this time frame as well. If it has been a lean snow year, it is possible that the Yellowstone River may be fishable as well. 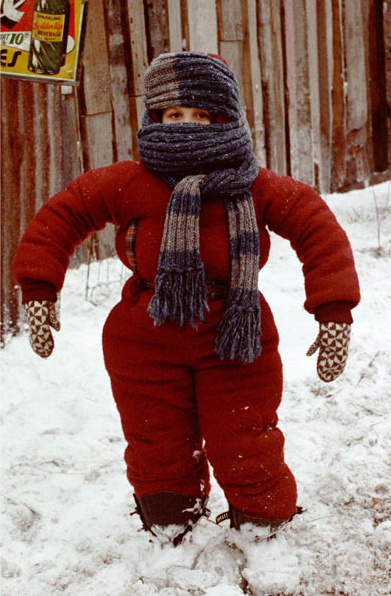 You shouldn’t count on this, but be prepared if the opportunity presents itself. The town of Gardiner, MT makes a good base during this transitional period. You can be on the Gardner River in a matter of minutes and Trout Lake, in the Lamar drainage, is a manageable day trip. The Yellowstone flows right thru town, and you are close to good access if it is in fact clear enough to fish. The entire northern portion of Yellowstone Park will fish well in this time frame, giving the angler plenty of options. 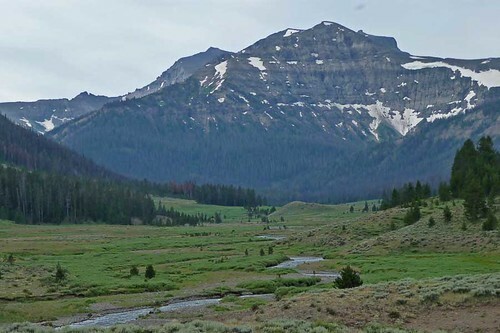 The Gardner and Yellowstone will fish well early on in July, with Slough Creek, Soda Butte Creek, and the Lamar River gradually becoming fishable in that order. The Lamar is usually fishable by mid-July, but won’t be ready until the end of July after a winter of above normal snow. This is the time of year to fish terrestrials, and hopper fishing is something that serious anglers look forward to all year. 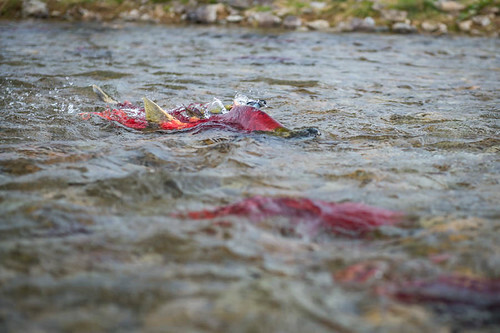 During August, the above rivers are still fishing well, but fishing pressure can be high. This is a great time to get out the hiking boots and check out some of Yellowstone’s small creeks and backcountry waters. 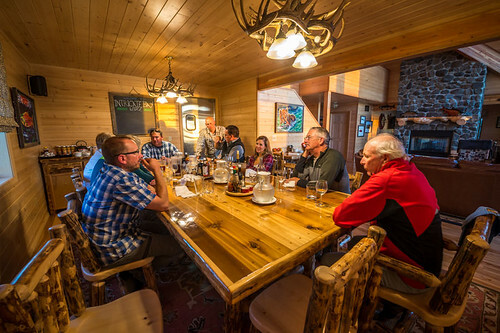 The best mid-summer bases are out of Gardiner, MT and Cooke City, MT. Cooke City is very convenient to access Soda Butte, Lamar, and Slough. 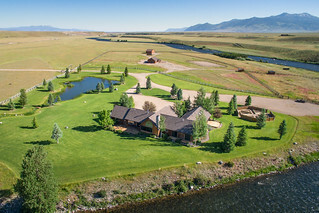 Gardiner provides easy access to the Gardner and the Yellowstone, while the Lamar Valley is a manageable day trip. September is an interesting month, as it can be warm and sunny or snowing, sometimes both in the same day. 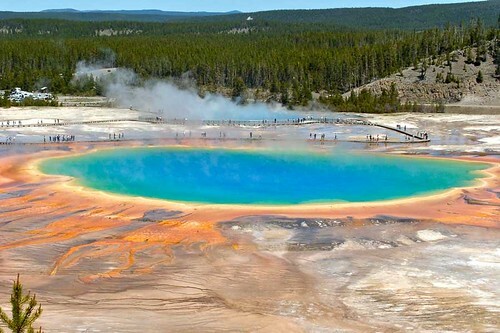 This is another time of transition in Yellowstone Park. During early September, the Lamar Valley streams are still fishing, though the fish are quite spooky as they have been fished hard all summer. By mid-month, the waters of the Madison drainage will have cooled enough to fish well again. Both the Yellowstone and Gardner River should fish well all month. If you are visiting in early September, Gardiner, MT is probably the best base. The Yellowstone and Gardner will fish consistently, and you can make the day trip to the Lamar Valley if it is fishing well. Towards the end of the month, West Yellowstone would make a good base as well. The Firehole will be fishing well and some early migrants will be showing up in the Madison from Hebgen Lake. While this run peaks in October, a few fish will be present later in September. Just as it was at the start of the season, the Madison drainage is the place to be for the last month, up until the season ends on the first Sunday in November. Large trout push out of Hebgen Lake on their spawning run, giving anglers the shot at the biggest fish of the year. These fish are available in the Madison River as well as the lower reaches of both the Gibbon and Firehole. Target these fish, which average between 16” and 20”, with large nymphs and streamers. On the Firehole River above Firehole Falls, hatches of Blue Winged Olives draw fish to the surface all the way to seasons end. The Firehole provides a great change of pace to chasing the big migrants during the fall. As in June, West Yellowstone, MT and the surrounding area is the place to be in October. 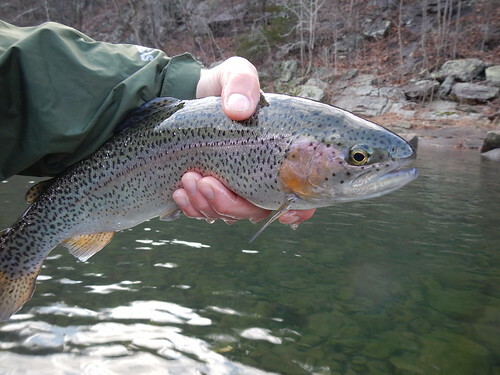 The large trout will be stocked during the preseason and in-season spring stocking periods to coincide with the period of peak angler use. Both of these stockings will include a number of these larger fish. The PFBC website or FishBoatPA app should be consulted for the actual stocking dates. • Approved the purchase of an easement of approximately 250 linear feet along Elk Creek in Fairview Township, Erie County, for $3,750. The easement area is located off of Luther Road across the stream from Folly’s End Campground. • Added 99 waters to the list of wild trout streams, revised the section limits of seven waters, and removed one water. The list can be found on the PFBC website. • Added 26 stream sections to the list of Class A wild trout streams. The list can be found on the PFBC website. • Approved a proposal to continue stocking Section 4 of Bald Eagle Creek in Centre County, which is classified as a Class A wild trout stream. 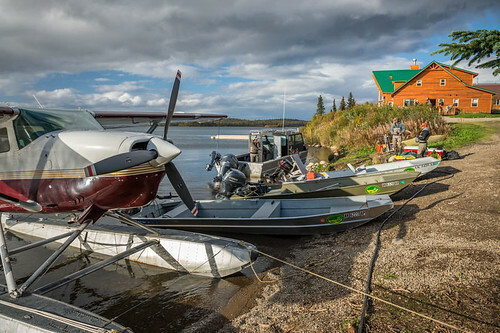 The 5.72-mile section begins in the Borough of Milesburg and extends to the inlet of Foster Joseph Sayers Lake and is extremely popular during the traditional spring stocked trout season. It also receives a significant volume of cold water from Spring Creek and therefore supports a robust wild Brown Trout population and year-round fishing opportunities for wild Brown Trout and stocked fingerlings and adult stocked Rainbow Trout. • Approved a grant of up to $115,000 to the Doc Fritchey Chapter of Trout Unlimited for a habitat restoration project on Snitz Creek, Lebanon County. The stream suffers from bank erosion and heavy sedimentation with limited instream habitat for fish. The project will include stabilizing streambanks to reduce erosion, installing instream habitat structures to provide cover and resting areas for trout, removing invasive plant species, and installing fencing and a cattle crossing to control livestock movement in the stream. Here is the a rebroadcast of the PFBC Meeting. Winter can chase even the most avid angers off the water for months. Some focus their time tying flies or bantering on the forums. Many enjoy the many outdoor shows. 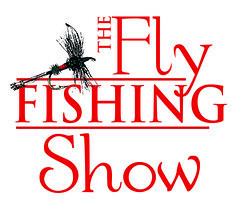 The Fly Fishing Shows are the best programs focused exclusively on fly fishing. They are highly regarded for the opportunity to check all the new gear. But the shows hold so much more! 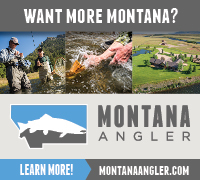 Sure it is a great place if you are looking for trips, rods, reels, flies, waders, tying materials or any fly fishing gear. More importantly, in todays online world it is the best way to get face to face with manufactures, vendors and industry experts. You can even try casting many of the rods you just read about. Each of the shows is multi-day event that includes a very large exhibit floor, fly tiers, retail shops and plenty educational programs. The outstanding classes are lead by some of the best pros in the business. Many of your favorite celebrity authors are found teaching techniques and sharing some great ideas on how to improve you fly fishing. Some of my favorite classes are programs about fly fishing locations near and far. For me,The Fly Fishing Shows are a great chance to catch up with some friends I don't often see. There is always plenty of members from Paflyfish wondering the exhibit floors. The Somerset, NJ show is one of the biggest of the shows and the Lancaster event is clearly located located close to home. Here is a full list of the upcoming schedule. I like going to both! You can found out more about times, entrance fees and detailed locations here at the Fly Fishing website. 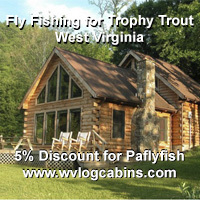 For some more conversations follow along here on the Paflyfish forum. 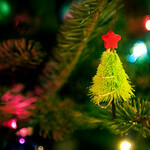 I was catching up on some of the recent threads in the Paflyfish Fly Tying Forum and found a post from Night_Stalker about a Christmas Tree Fly. Digging a little deeper into the post I checked out the post originating from Louis Cahill at Gink and Gasoline. 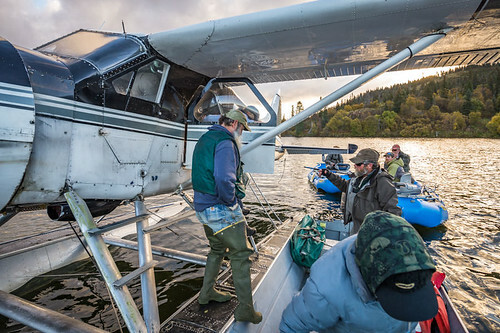 Louis is an advertising photographer and along with Kent Klewein share their fly fishing stories on Gink and Gasoline. I have enjoyed many of their blog posts, but had missed this one from a couple years ago. Well Loius served up a little holiday fly tying wonderment with his post a couple years ago and should you should check out his Christmas Tree Fly post and the Gink and Gasoline blog. Large Pennsylvania streams and rivers in October and November can provide an interesting grab bag of fish that might munch our flies, and big weedless streamers are the way to go. 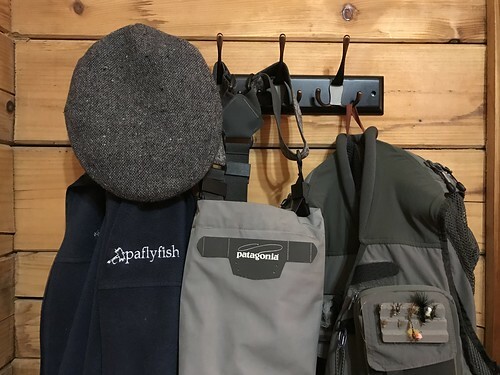 For many Pennsylvania fly fishermen, October and November are months when they return to stream trout fishing, if they ever left. In particular, years such as this one magnify this effect as we have spent what seems like many months waiting for rain and cooler temperatures and are especially eager to get back out for trout. Some fly fishers gave the river bass game a go-round during summer, but soon are back on trout streams as the days get shorter and colder. 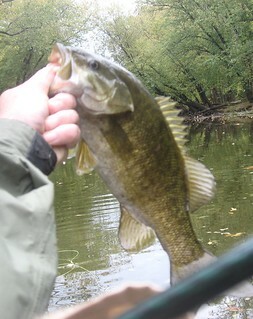 Few die hard fly fishers stick with bass by late October. Try checking out a mid- sized or larger bass river in late October: a fly fisher is a rare sight. Spin fishers, by contrast, know that late autumn fishes well on the big rivers. Bass are still active and walleyes, pike, and muskies are on the prowl. 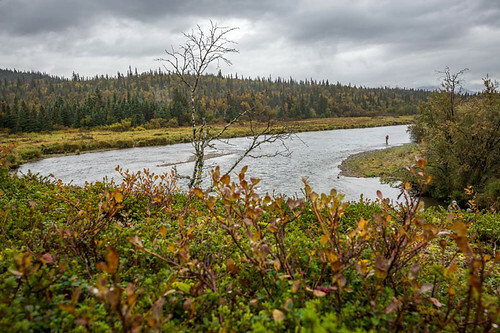 In addition, many of the larger streams and mid-sized rivers have transient populations of large, wild brown trout in the “transition zone” – that is to say the lower reaches of what normally passes for trout water (or where it is stocked) that transitions into a warm water fishery. These fish drop back downriver during the autumn, or migrate out into rivers from colder tributaries. To be sure, these trout are hard to find, cagy, often nocturnal even in colder periods, and are a specialized game. Nevertheless, they are part of the mix. Some very large browns fall to spin guys fishing tubes and swimming plugs for bass and walleyes during the colder months here in Pennsylvania every year. 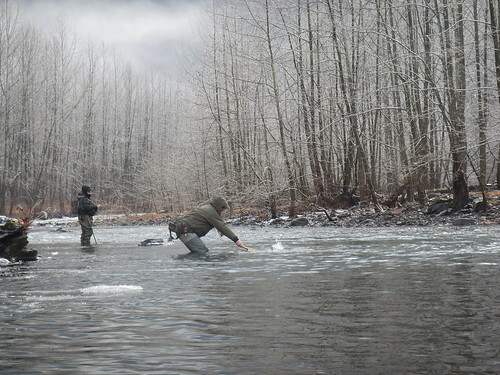 Chances are, there are some big rivers near you that you might consider fly fishing in the coming weeks. 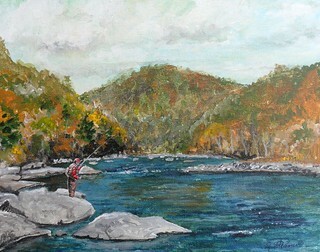 Larger tailrace rivers such as the Delaware, Potomac, Lehigh, Youghiogheny, or Allegheny have trout in their upper reaches, but gradually these rivers transition to warm water species downriver and are associated with smallmouth bass, walleyes, and muskellunge. With colder temps in autumn, large trout will sometimes migrate downriver into these areas associated with warm water fishes. Larger trout streams or “creeks” such as the Little Juniata, Frankstown Branch, Raystown Branch, Swatara, Mahoning, Clarion, Schuylkill, Tionesta, Shermans, Conodoguinet, Penns, Pine, Shenango, and other similar streams all are popular for both bass and trout. Moreover, about half of these creeks have muskies or tiger muskies. Smaller waterways such as these are prime spots to target bass, trout, and even muskies in late autumn. Even the West Branch Susquehanna is coming to be associated with stocked trout in its upper reaches these days in addition to its much-improved (now superb) warm water fishery downstream. On waters such as these during the late autumn colder temps and shortening days put big river smallmouth bass in an aggressive mood. Big browns, and muskies are on the prowl as well and they’re not looking for a size 18 dry fly, they want a meal! Chubs, fallfish, shad, suckers, big sculpins, madtoms, and shiners are on the menu and these baitfishes have had a season to grow and are large, typically several inches in length and often much larger. 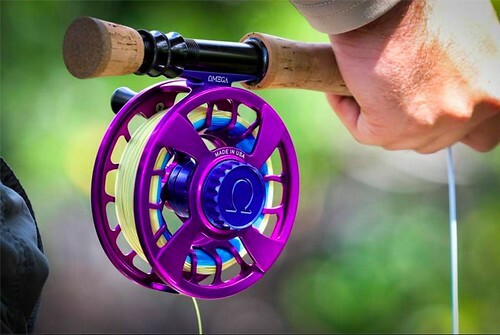 This is the time of year to throw big streamers with at least a six-weight rod. Oftentimes, an eight- weight is better. A floating line works fine although if you’re working deeper rivers with current, a sinking line will get you in the strike zone. Any large streamer can work, but I like articulated doubles using soft materials and deer hair. Clip the hair in a large spun head that pushes water. Deer hair can make a fly more buoyant and wind resistant, but such sparse, spun deer heads also produce a fly that has a nice side to side, erratic swimming pattern when stripped and stopped. This side to side swimming pattern is deadly. Generally, for this game I like flies in the four to seven-inch range or larger if you’re hoping to target toothy critters. Twenty-inch brown trout, or smallies in the mid-teens, are fish that can easily inhale and swallow six-inch prey species. I like double hook flies since trout and muskies often seem to seize the fly mid body and often need a trail hook for solid hook-ups. Bass, by contrast, only need a single hook at the front of the fly for good hook up ratio as bass are head hunters. Colors are a matter of preference, but the old wisdom about “dark day, dark fly” holds true in my opinion. Black and chartreuse is tough to beat in stained water. A major challenge to this season is leaves and weed break-up. In late September, many rivers see a break-up of grass beds and this results in a lot of junk in the water column. By early October, much of the weed break-up is done, but leaves start to foul the water column by mid-month. 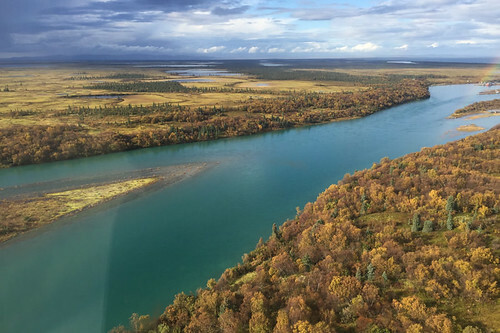 By late October, leaves can make fishing nearly impossible in some places, especially on windy days. To contend with this, you will want a fly tied weedless so as to pull through the leaves. 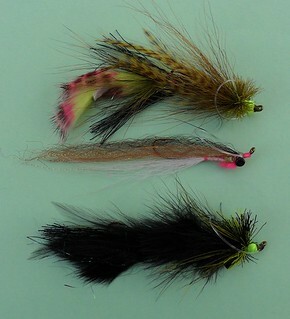 The flies depicted here are examples of typical streamers I’d reach for on autumn rivers. The key is a decent weed guard design. I prefer mono loops tied in at the hook eye, as can be seen. For larger patterns such as these, fifty pound mono works best. I generally put a weed guard only at the lead hook and not the trail hook. You’ll still catch some leaves, but weed guards will at least allow you to fish fairly effectively where conventional flies would immediately foul. 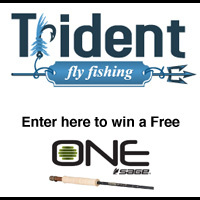 Experiment and find a design that works for you – just keep the fly at least four inches long. Bigger is better. 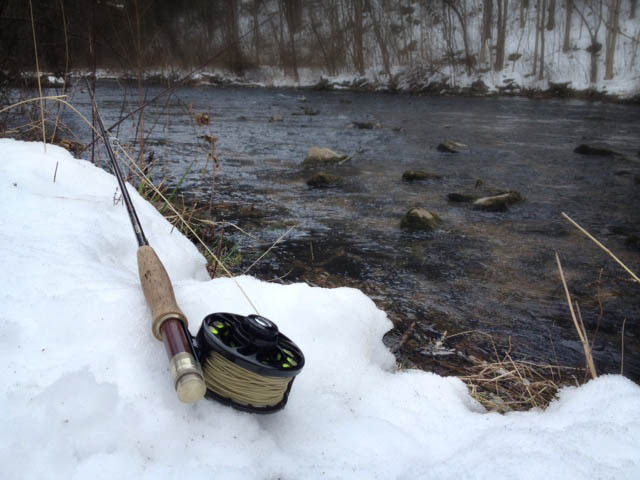 October and November are great months for fly fishermen in Pennsylvania. Target the transition zone on larger creeks and rivers and you will have a genuine shot at multi-species if you throw big streamers. To be sure, smallmouth bass will be your most likely catch, but large brown trout and muskellunge are out there too. Just the other day, I was wading a favorite pool on a mid-sized creek and could see a brown trout, a three-foot-long muskie, and several smallies in the mid-teens. . . all within casting range. Catching all three species in a day would be uncommon in my experience, but the possibility exists if you’re at the right time and place. So, tie up some big weedless streamers and get out on a big creek or river this fall. 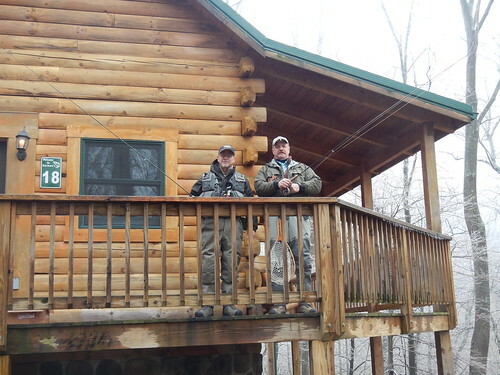 The trout guys will be nowhere in sight and many of the summer bass fishing regulars are sitting in a tree stand. You’ll probably see few anglers. Double haul that big streamer out, strip it back through the leaves, and hold on when you see that big swirl or feel that pull. You may even have to fight the fish to surface before you’ll even know what chomped your fly. A motivating experience during a great time of year! Tightline Productions has done a real nice video giving a step by step for Olive Woolly Bugger. This is one of my favorite flies to use almost year round. In the spring when there is no hatch or in the summer going for bass, I just love tossing this woolly bugger for some action. Enjoy.